When an occasion calls for luxury in abundance, this commanding collection offers a royal delicatessen's worth of imported goods. An unparalleled collection of charcuterie, imported French cheeses and gourmet pairings, both savory and sweet, served in a large hamper. When the occasion calls for luxury in abundance, this commanding collection offers a royal delicatessen's worth of imported fare. Spanish Iberico Ham, Monte Chevre Truffle Goat Cheese. Stuffed Olives, Cheese Stuffed Peppers, Barrel Aged Balsamic. Blood Orange Olive Oil, White Truffle Oil, Toscano Fennel Salami. Four Artisan Cheeses, Dipped Chocolate Oranges, and more. Each gourmet item is carefully assembled inside this hamper to safeguard the shipping process. A free card is included with your personal message or greeting, as well as complimentary scissors so your recipient can easily open their gift. 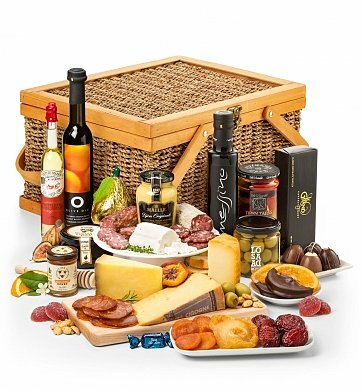 Your gift will leave a lasting impression as they continue to use and enjoy this elegant hamper, perfect for day trips, picnics or an afternoon at the beach. Measures 9" x 11" x 10". Imperial Cured Meat and Cheese Collection is a hand delivered gift. These gifts are delivered by one of our local design centers located throughout the United States and Canada. Same day delivery is available for most gifts when ordered before the cutoff time. The cutoff time for Imperial Cured Meat and Cheese Collection is in the recipient's time zone. Belgian Chocolate Truffle BoxEnjoy a variety of four couverture Belgian chocolate truffles, made with premium ingredients for a luxurious tasting experience. Boyajian Balsamic VinegarThis balsamic vinegar is imported from Modena, Italy. Aged for up to 12 years, it is selected for its "dryness," flavor and aroma, reminiscent of autumn leaves. Fig and Orange SpreadSummer's best figs laced with a tangy twist of orange create a fruit spread ripe for pairing with cheeses, topping toasts, and brightening desserts. Excellent variety of meats, snacks and cheese. My family in the States really enjoyed this basket full of goodies. You have won another very satisfied customer for special occasions. Thank you! My client received this gift basket from me! Her comments were. "Are you for real? The gift is absolutely unreal! I cannot wait to enjoy this amazing collection." I think that the gift basket did exactly what it was intended to do. Show gratitude and delight my client. Mission accomplished!